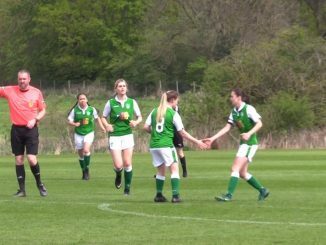 Hibernian remained unbeaten in their UWCL campaign, netting a late leveller to draw 1-1 with Kharkiv on Friday morning. 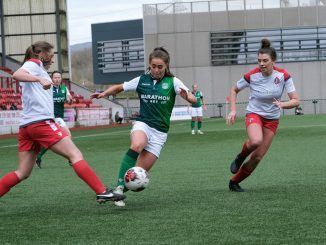 Hibs began the second match day as leaders in their Champions League qualifying group, as they took on Ukrainian side Kharkiv at the Cluj Arena in Romania. 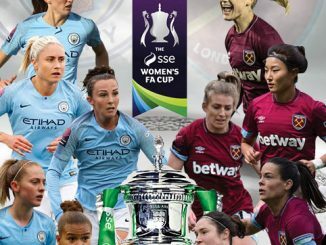 Lucy Graham had an early attempt blocked in front of the keeper but Kharkiv then had a spell of pressure, with a dangerous ball into the box being cleared by Joelle Murray. 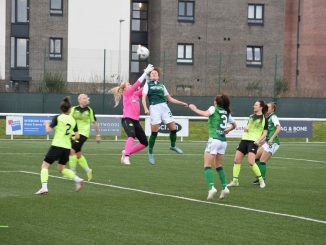 There were chances at both ends around the 20-minute mark, as Yana Kalinina missed an open goal after a mix up in Hibs defence and then Abi Harrison shot straight at Daryna Bondarchuk at the other end. Approaching the interval, keeper Hannah Reid turned Kalinina’s flick header away from the bottom corner but moments later the deadlock was broken, as Kharkiv’s Yana Malakhova was allowed a free header. Two minutes after the restart, Graham found space to meet a corner at the near post but was unable to direct her header on target. A penalty appeal for a push on Harrison was denied and the same player soon went through on goal, only to be thwarted by Bondarchuk, who was out swiftly to smother the shot. However, with 10 minutes left, Hibs equalised as Graham nodded in a cross from Murray. While Swansea City face the group hosts this afternoon, Hibs finish against Cluj on Monday.